I don’t want my wedding to look dated. Wait. Clarification: if my wedding looks dated to my children, well, of course it does. If it looks dated to a friend getting married in ten years, fine. But I don’t want it to look dated at the moment it is happening to the people who are there. I realize worrying about this is a waste of life. I don’t understand wedding trends, at all. I just pulled up The Knot’s lists of hot wedding trends for 2010, 2009, and 2008. Half the items are the same throughout the years (variations on “rustic festive”), but others insist that something is the new something (e.g., “steel gray is the new chocolate brown”), implying that if you pick the old something, your guests will judge you for it. So, here’s my problem. I started consuming wedding images about five months ago. In that time, I fell in love with certain design elements (like I mentioned the other day, the birdcage veil). I assume those have been trendy for a while now, or they wouldn’t have trickled down into mainstream wedding literature. My wedding isn’t for at least a year. If I wear a birdcage veil, will I look like someone on vacay from three years ago? 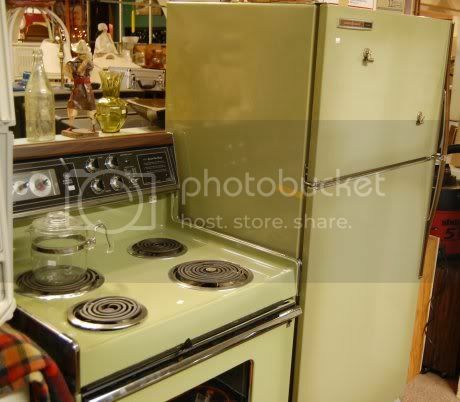 If you have an Avocado fridge in your kitchen left over from the 1970s, there’s something charming about it (I’m talking aesthetics here, people, let’s just assume it still works and you aren’t regularly suffering from food poisoning). If you buy a new avocado fridge today, it could have the “retro-chic” appeal of a milk glass cake stand, a Knot-approved wedding trend for 2010 (which I’m guessing means something that’s been a staple of bloggy weddings since I was still in undergrad). But what if you bought someone an avocado fridge in 1982? Wouldn’t you be much more likely to get hit with the Present Face? There’s a dead zone in the continuum from original to trendy to ubiquitous onward to retro-chic: played out. And as much as I don’t want that for my wedding, I don’t have the time, or energy, and least of all the savvy to figure it out. The key to this, however? Nobody else who attends the wedding will be remotely aware of wedding trends, either. Not one among them will look around at the decor and snidely mutter to his or her companion, “Can you buh-LIEVE she went with chocolate brown? Are you kidding? That is SO TWO YEARS AGO. She should have used STEEL GRAY.” No. They are just going to glance around and assume you have a thing for chocolate brown, then go find the bar. Same with the birdcage veil. If you wear that, you are going to appear, to your guests, to be someone who prefers to wear a short, jaunty headpiece over a long, drapey veil. I agree with this!! When we were choosing our ~colors~ I was very hesitant to go with grey, navy and yellow because I knew it was a big wedding trend and thought people would judge us. But then I remembered that none of my guests were spending hours every week trawling through wedding blogs or attending 15 weddings a year. So rock that birdcage veil! It is true that my guests will be even less aware of wedding trends than I am. Thanks for the wisdom! Also, gray + navy + yellow sounds gorgeous. Hmm… I feel like there should be a mathematical equation for this. If (your wedding date) – (the date of peak birdcage veil popularity) = in range of timeline for ‘retro-chic’…then you are good to go! Now just fill in dates for those variables and we’ll be set. I agree with lyn that no one knows about wedding trends unless they are themselves planning a wedding. And its all arbitrary, really. If the birdcage looks bomb on you, who is to argue!? Finally, I think there are ways to update the birdcage so that it still feels modern. I’m loving the combo of big flower and some feathery bizznass with a birdcage veil. The veil part can be big and cover much of your face or it can be small and really just be an accent without covering your face. Lots of options to keep it fresh! Find something that looks good on you and that makes you feel beautiful. Confidence is timeless! “Confidence is timeless!” What a great thought. Thanks. I second everything lyn said. She is brillant.